Hey Mark, don’t worry. We’ve all had those curiosities. Those dark, digital urges… and for the most part, they’ve worked out fine! I honestly don’t get the reaction that certain retailers have had to Mark and Marvel’s new digital initiatives. We’ve been having different versions of the Print vs Digital debate for years now and I really think it’s high time that retailers stop acting so shocked and appalled that digital comics exist. Maybe one day digital comics will be all we have. Maybe they will actually drive up demand for print comics the way digital music has led to a resurgence of vinyl records. Either way, one thing needs to be accepted and accounted for by everyone: Digital comics are here. They aren’t going anywhere. Banning an artist or writer’s work from your store only shrinks the products you can offer to a customer and leaves a bad vibe hanging over your store. And, speaking of those print comics, guess who just smashed two walls in their store and is having a special sale this weekend? That’s right, us guys! 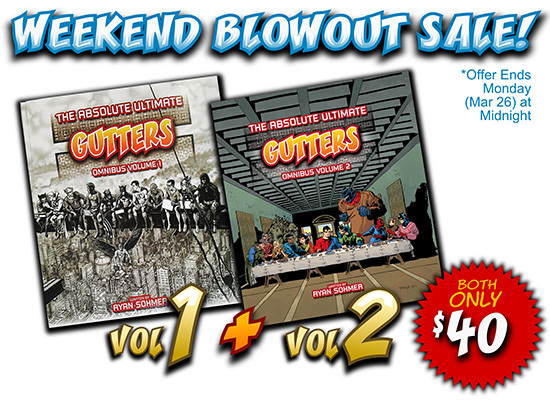 This weekend only, you can get 2 Gutters books for only $40! The sale is only this weekend, so jump on it! Originally from Sydney, Australia, Bill Mund is a freelance Illustrator represented by Drawing Book Studios. Through his freelance work he has worked with Universal Music, Red Bull, Cuervo, Westfield, and even those Yolanda Be Cool guys. His style is not easily described by using serious, Art Historian vocabulary and has been known to “ruin childhood memories”. When he isn’t drawing in solitude he is usually drawing with his Girlfriend-Animator Katy in their flat in Bristol, UK. On a slightly more personal note, it’s been kind of a rough week around these parts. But no matter how bizarre real life gets, I always get a kick and more than one “LOL” out of the comments you guys leave on theses pages. Gutters has the potential to be an absolute old-west shootout, but I’m always pleased to find some really great points and interesting discussions happening in our comments section. So thanks for that, and please keep it up! Until next time, be good and see you Monday! ** You never know, that one may happen. They’re really nice books.